My Kind Of Introduction: Are You Itching to Learn a New Craft? Have your tried Craftsy yet? If you answered "No" then your missing out... BIG Time!! 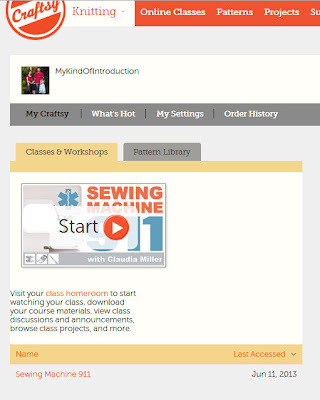 If you've ever wanted to learn how to sew, quilt, knit, cake decorating, or pretty much anything else creative.... Craftsy can help you! They offer online classes on tons of different topics who are taught by the very best in that line of interest! The prices vary by class but Craftsy also offers FREE Mini Classes! I just enrolled in the Sewing Machine 911 Mini Class and I can't wait to begin!! I use to be able to run a sewing machine wonderfully but it's been many many years since I've used one and I need a refresher before I start any projects! --Creative Quilt Backs: Make the back of your quilt just as interesting as the front! Oh, Fransson! blog author, Elizabeth Hartman, walks you through everything you need to know to make beautiful quilt backs. --Know Your Wool: Do you wonder where your yarn comes from? Learn about different types of wool and the individual characteristics of each. --Micro Torch Basics: Go ahead, play with fire. Using a butane micro-torch, learn the basics of creating beautiful and unique metal jewelry in your own house. --Modern Buttercream: Learn to use buttercream like a pro! Discover the tricks and tips to construct and create a beautifully finished buttercream cake. --The Hand-Painted Cake: Elevate your cake with Erin Schaefgen's freehand painting techniques. Create beautiful and edible works of art with Erin's tips and tricks. Begin your Crafting Journey with Craftsy today!